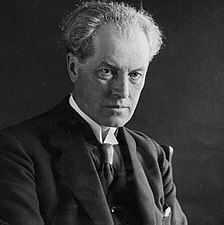 Torgny Karl Segerstedt (1 November 1876 – 31 March 1945) was a Swedish scholar of comparative religion, later publicist and editor-in-chief of the newspaper Göteborgs Handels- och Sjöfartstidning from 1917 to 1945. As such he is remembered for his uncompromising anti-Nazi stance. Torgny Segerstedt was born in Karlstad in Värmland County, the son of the teacher and publicist Albrekt Segerstedt (1844–1894) and Fredrika Sofia Bohman. He earned a candidate of theology-degree from Lund University in 1901 and in 1903 he became a lecturer in the history of religion. He was a lecturer in theological encyclopedics at Lund University from 1904 to 1912 and a professor in the history of religions at Stockholm University from 1913 to 1917. He is referenced in the following quote, "In this sense our experiment can also be interpreted as another confirmation of the nonobjectifiability of quantum mechanics or, as stated by Torny Segerstedt, 'Reality is theory.'" Torgny Segerstedt married his Norwegian wife Augusta Wilhelmina Synnestvedt in 1905. Their children are the philosopher and sociologist Torgny (T:son) Segerstedt (1908–1999), and the journalist and politician Ingrid Segerstedt Wiberg (1911–2010). Torgny Segerstedt is the subject of the 2012 Swedish film, The Last Sentence, directed by Jan Troell. ^ "Wave-particle dualism and complementarity unraveled by a different mode". National Academy of Sciences. Boston Interactive. 2014. ^ Robach, Karin (22 May 2010). "Ingrid Segerstedt Wiberg" (in Swedish). This page was last edited on 26 September 2016, at 08:12 (UTC).